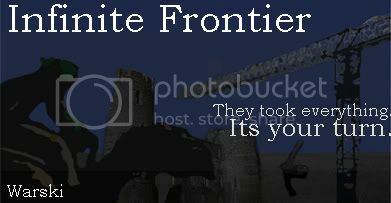 Alright so Infinite Frontier is gonna be a big game. And when I mean big, I mean frickin big. Pet System - Raise your pets, feed them, and watch them turn into beasts. Then use them to fight. Romance System - Find love around, and reap the rewards. Anime Scenes - I got a friend who is doing anime pics of some of the cutscenes. Make it a little more intresting. Jailing System- Once you get a base set up, you will be able to clean up the streets. Get rid of the scum. Day/Night system - I want to use the Dynamic Day and night system. Card system - My buddy is gonna draw intense pics of the charsets I got, but I need a script for it. Sarah has been Rez's friend for years. She helped him coap with his parents death, and she to needs to do something new. She embarks on the little adventure with Rez. But will she be able to handle it? Dread has done some things he might not be to proud of, part of this unknown group. But joining the group, he will take it all back.... as the story unfolds. In the little Village of karkan, lives two friends; Rez and Sarah. They have been working a little, just to make ends meat. But now they yearn for more. One day while exploring Karkan Hills they see a couple of unknown men walking into a cave after talking for a bit. Being the curious children they are, they decide to follow. But what they see and what happens.... I cant say. You have to find out. The maps areas are big. And theres a lot to do while exploring these maps. And you never know but you might run into some heafty rewards. There are gonna be a lot of side quests slapped around, and some of them will enhance the story teaching you more about certain characters, and maby even finding new ones. They will also throw rewards out like secret weapons and summons. And you could maby find a secret area or two. Anime Scenes- Little shorts of anime pictures that will enhance cutscenes. Find a egg, raise it for a bit, it hatches, feed the little monster food, and depending on the food they eat, they will evolve into something else. Simple. Then there are certain areas, they only certain monsters can enter. Example: Theres a cave out of reach, only a bird type monster can enter. Theres a undergound passage way, but theres so much heat that you could die, only a fire monster can enter there. Day/Night System- Some things will happen at night that wont in the day. And vice versa. Thinking about making certain shops close at night. While backally shops open at night. Card game- Buy, Find, whatever cards. And then go into card battles.